Controlling an aircraft is a complex task. There are a lot of things you need to think about – pitch & power, yaw, roll – all these movements and inputs have to be coordinated. Especially maintaining a certain attitude is difficult in the beginning. You always have to use some force to move the controls and bring the airplane in a different attitude and keep it there. That’s exactly the point where trimming kicks in. An aircraft which is ‘in-trim’ can also be seen as ‘balanced’. All forces are in equilibrium and therefore – if there is no other controls input – our plane will maintain a specific speed (since the angle-of-attack will stay the same and so the lift/drag ratio). Why is trimming so important? Trimming makes piloting easier. Instead of always ‘fighting’ against our aircraft (to be precise: against the forces we’re exposed on our controls) we make use of the trim wheel/switch and use these forces to help us. We don’t have to use a certain amount of force to keep contolling our plane. A correctly trimmed aircraft will basically fly on its own. So the reason why trimming is absolutely important to us is, that it makes our job easier. We gain free capacity if we don’t need to ‘physically (this means with the use of force) control’ our aircraft. We don’t ‘need’ to stick to the speed indicator (especially during final approach), we have the capacity to look outside the canopy! How do I trim my aircraft correctly? People tend to use the trim wheel / switch as a primary control – but that’s wrong. When you release the controls now (just for a second) your aircraft should maintain the speed / attitude. You’re ‘in-trim’. If this is not the case just start again from the beginning. 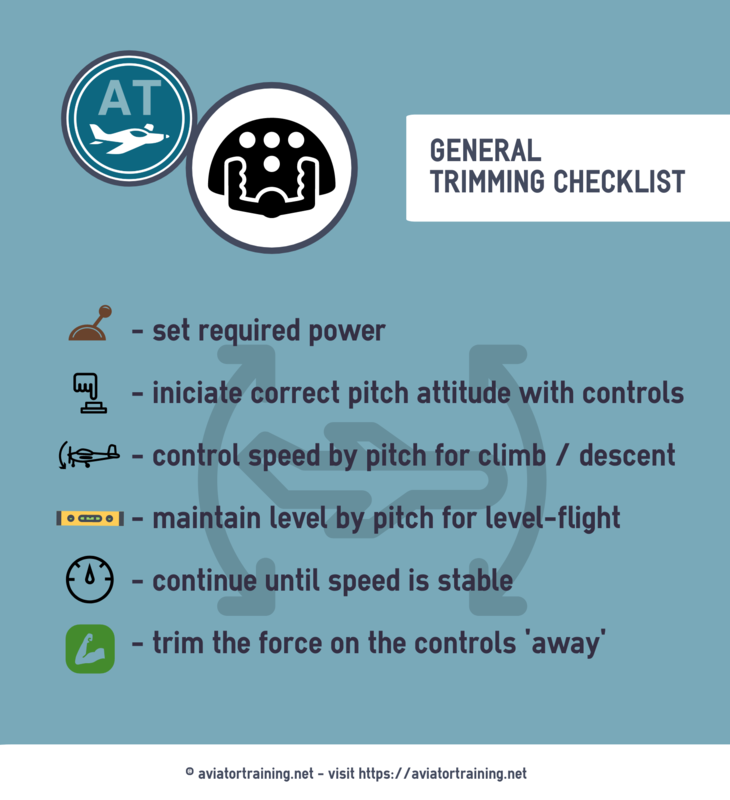 Please note: Every change in your power-setting and / or attitude will require re-trimming the aircraft! You can also download this ‘trim-checklist’ for your reference. Trimming makes our life easier. It gives us additional capacity for other tasks we have during flying. Checking the approach charts on your kneeboard is definitely easier when you have both hands free. It should not be treated like a primary control, don’t fly the trim-wheel, fly the aircraft! The correct trimming procedure is not very difficult, nevertheless it should be trained extensively during basic training. Then it will make us fly safer.